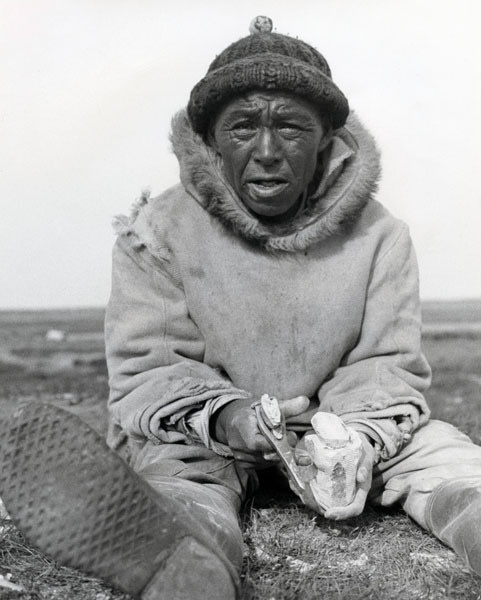 Born in 1918, at Issuksiuvit Lake, near Puvirnituq. Drawing, printmaking, and some sculpture. Papialuk demonstrated a conceptual awareness. He also devised his own conventions of communicating important, yet intangible, landscape elements such as wind, the movement of people and animals, sound, rain, and temperature. Rather than carving away imperfections in stone, he often circled them, and occasionally carved stitches around them (Mitchell 1997:40). Papialuk was one of the few Inuit artists to ever have a solo exhibition at the National Gallery of Canada: Every picture tells a story (2003–2004). Sculpture eventually became secondary to Papialuk’s graphic art. He was one of the first Puvirnituq artists to get involved in printmaking and to introduce the use of colour in his stonecut prints. Papialuk was a key contributor to the community’s print collection from the 1960s to the 1980s. in Eskimo Sculpture, an exhibition at the Manitoba Legislative Building in Winnipeg in 1967. 2004 “Every picture tells a story by Josie Papialuk at the National Gallery of Canada,” Inuit Art Quarterly (IAQ), vol. 19, no. 1 (Spring):26–28. 2004 “The life and times of Josie Papialuk,” Inuit Art Quarterly (IAQ), vol. 19, no. 1 (Spring): 18–23. 1997 “In Memoriam: Josie Papialuk 1918–1996,” Inuit Art Quarterly (IAQ), vol. 12, no. 3 (Fall): 40. 1988 “Josie Papialuk,” Inuit Art: An Anthology. Winnipeg: Watson & Dwyer Publishing.